Pin headers：The collective name for terminals (pins, sockets,jumpers) that are mounted on PC boards. 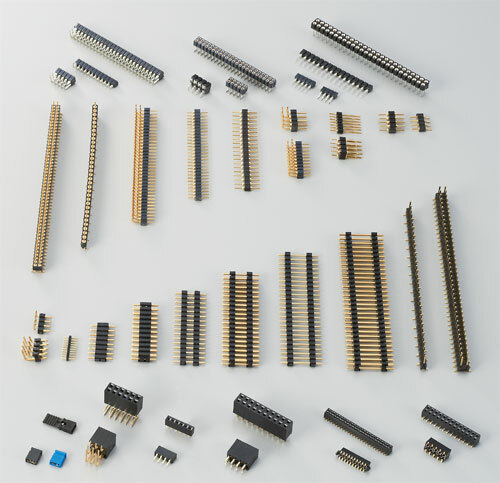 Pins Besides acting as a circuit terminal by insertion (DIP) or surface mount (SMT) soldering on a PC board, pins secure space when sandwiched between boards or fix multiple boards vertically or horizontally. Sockets Besides being inserted (DIP) or surface mount (SMT) soldered on a PC board to link circuits as the receiving side for pin insertion (release), sockets are also used to secure space between boards and fix boards together in the same way as pins. Jumpers Jumpers are mounted on pins to link circuits between adjacent pins and are used for changing settings, upgrading, and resetting board circuitry.